Photo Courtesy of Eric Rogers The American Tobacco Trail is a 22 mile Rail-Trail that runs from Durham south to Apex, North Carolina on the former Norfolk Southern Railroad line. The name of the trail reflects the main cargo of the railroad which was built in 1906. The northern section of the trail is paved but some of the southern sections are largely grass or clay. South of I-40 and Massey Chapel Road, the trail opens up to equestrian use and winds through piney woods and neighborhoods. The trail offers the chance to view lots of wildlife including beavers, herons, hawks, songbirds, vultures, squirrels, owls, and deer. The Rail-Trail was funded through 8 separate Transportation Enhancement projects from 1996-2006. 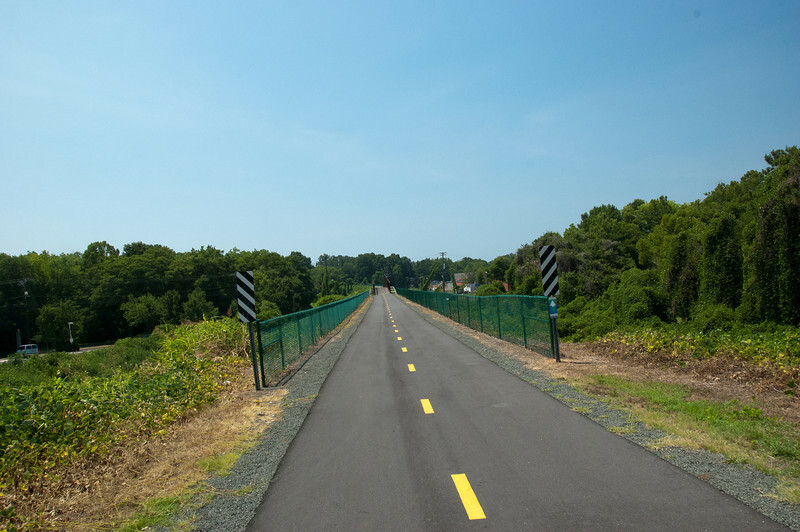 In total $2.6 million in TE funding was awarded for the construction of the trail with another $650,000 in local match funds. The trail was completed in early 2012. For more information on the trail, please visit the Triangle Rails-to-Trails Conservancy.